Workers at the secretary of state's office in Augusta process ballots Saturday in Maine's 2nd District U.S. House race. AUGUSTA, Maine — As ballots continued to be processed Saturday in Augusta, incumbent U.S. Rep. Bruce Poliquin, R-Maine, expressed concerns about ranked-choice voting for Maine’s 2nd District seat. 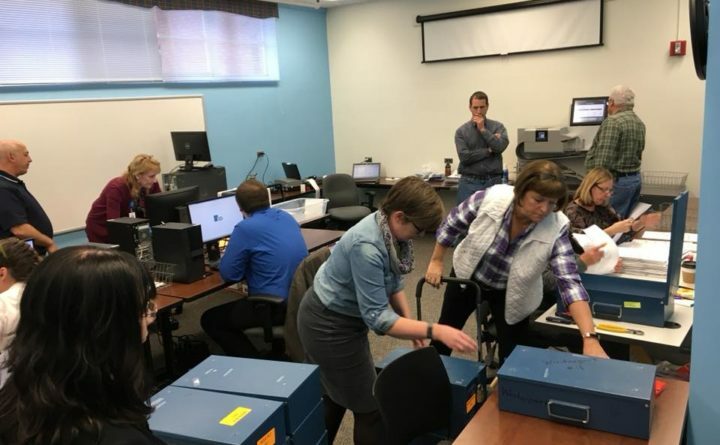 The Maine secretary of state said all ballots from towns in the district have been delivered to Augusta, where they will be scanned as part of the ranked-choice voting process. Neither Poliquin nor his top challenger, Democrat Jared Golden, received a majority of the first-choice votes, moving the election to an instant runoff, during which the second choices of two independents will reallocated among the remaining candidates until one reaches more than 50 percent of the ballots in play. With 95 percent of precincts reporting to the BDN, Poliquin, a two-term Republican, had 46.3 percent of votes to 45.6 percent for Golden. Saturday afternoon, Poliquin’s campaign said in a statement that although he “won Election Day,” he now has to wait for ranked-choice voting to play out, unlike in any other congressional race. The ranked-choice voting process, supported by Maine voters in 2016 and again in June, is expected to be completed early this week. The secretary of state’s office took Sunday off before reconvening Monday in Augusta to continue their work. Exit polling conducted on Election Day — administered by the BDN and funded by the group FairVote, with help by Colby College — showed that Golden is likely to overtake Poliquin for the victory after the second-choice votes of independents Tiffany Bond and Will Hoar are counted. The polling indicated that supporters of Bond and Hoar are overwhelmingly more likely to favor Golden over Poliquin. Still, the count of second-choice votes may not be the end of the debate. Poliquin could request a recount and could — as fellow Republican Gov. Paul LePage has urged — challenge the results in court if he wins an Election Day plurality before ultimately losing the race. This is the first time a U.S. congressional race using ranked-choice voting has proceeded to an instant runoff. U.S. Sen. Angus King and 1st District U.S. Rep. Chellie Pingree received more than 50 percent on Election Day, avoiding the need for additional rounds of vote counts.